Last week, an image was posted on Twitter by noted leaker @evleaks appearing to show a "SwiftKey Note" app for iOS from the company behind the popular alternative Android keyboard that ranked as the top-selling paid app on Google Play last year. 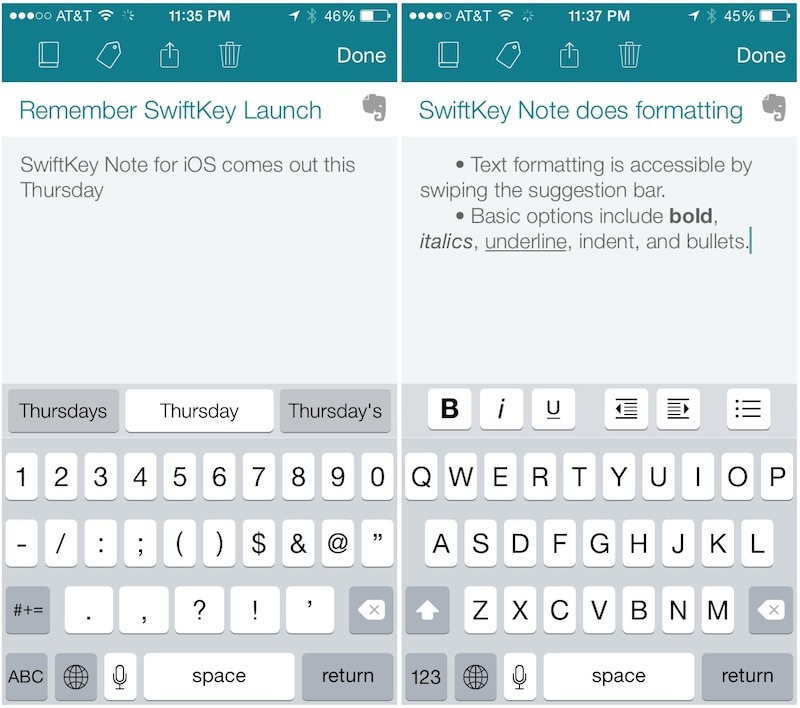 SwiftKey Note is indeed real and it launches today as a note-taking app that optionally integrates with Evernote's popular suite of apps. The app offers several features to allow for faster and easier note-taking, including automatic word suggestions based on context and personalized auto-correction. SwiftKey's suggestion and autocorrect features learn over time based on context from previous text entries, and can tap directly into a user's Evernote archive to assist with predictions. SwiftKey's Chief Marketing Officer Joe Braidwood told MacRumors that his firm was approached by Evernote early last year about the possibility of developing a SwiftKey app to integrate with Evernote, and the two companies have worked closely together and with Apple to bring that vision to reality. The new SwiftKey Note app supports seamless backup and two-way syncing, both with other instances of SwiftKey Note and with Evernote, allowing for easy note entry and editing in the app while notes propagate to other instances of Evernote. While SwiftKey Note does support some text formatting through easy swipe access to a toolbar, it does not support syncing of more sophisticated Evernote features such as advanced text formatting and embedded images. With Apple so far refusing to allow developers to create systemwide alternative keyboards for iOS, SwiftKey is limited to bringing its keyboard functionality to its own apps and releasing tools to allow other developers to offer it in their own apps on a case-by-case basis. As such, SwiftKey Note also serves as an example and marketing tool as the company looks to partner with select third-party developers going forward before opening up broader access through an open SDK. Apple's prohibition of alternative systemwide keyboards has also contributed to SwiftKey's decision to not include support for the gesture-based typing found in its Android keyboard. For the time being, SwiftKey Note includes only the standard iOS keyboard to ensure familiarity for users, augmented with word suggestions appearing by default in a narrow bar above the keyboard, although the "tap to dismiss" interface familiar to iOS autocorrect users is also an option. Gesture input may, however, also be added in the future depending on user feedback. One final key feature of SwiftKey Note is multilingual support, with the app able to offer contextual word suggestions in up to three languages simultaneously. Initial language support includes English (US and UK), German, Spanish (Spain and US), French (France and Canada), and Italian. Apple needs to get their **** together and let us use this system wide. The principle of "we know best, you don't need to change anything" doesn't really work when their solutions are dated and and kind of crappy. That formatting bar makes so much sense; it truly puts Apples current system of tap + hold + cycle through contextual menus to shame! This is the only thing which I really misses from my android experience. After months of use swiftkey learned my typing style in several languages and was absolutely amazing. This girl in the video is really beautiful! I've used these kinds of keyboards a couple of times before, but never seemed to get the hang of it. Is it really that much better? It's not really different than the standard iOS keyboard from a UX perspective, you're just getting some smart word suggestion/spelling corrections above the keyboard. The difference here is that the auto correct and word suggestions are learned (from Evernote in this case) and not only from a static dictionary, and they've made it one click. You'll need to be a heavy Evernote user in order to maximize the Swiftkey word database as it has no other sources to draw from. However, the best parts about Swiftkey from Android are still missing here: gesture based typing, and ability to learn from a multitude of sources (your SMS app, Facebook, etc). One of the main reasons I stay on Android. SwiftKey is just amazing. While I agree, Apple's become a massive battleship that is slow to make changes. Thus they're hell-bent on doing things their way only. SWYPE for example, has been out for _years_ and it's still off limits as prohibited by Apple. If Apple didn't invent it, they ignore it. They're all about self centered arrogance. Unless the idea comes from Apple, Todd B. ain't buyin' it!